Community Outreach | Cayla's Coats, Inc. 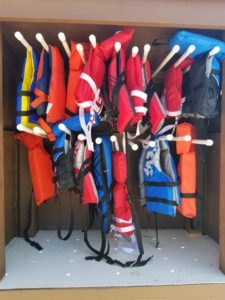 In 2018 Cayla’s Coats offered $11,000 in scholarships for children in need to gain the important skill of swimming and to be safer around the water. Our partners in our scholarship programs are Pediaquatics with Sarah Dodge and Citrus Memorial Health Foundation YMCA. 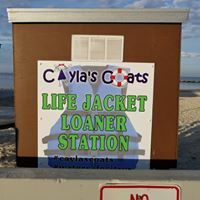 Cayla’s Coats has debuted our first Life Jacket Loaner Station in Citrus County with more to come. Our first station was installed at Ft. Island Gulf Beach in partnership with the Board of County Commissioners. Special thanks to Triton Lumber and Dockmasters of Homosassa for the donation of the lumber and to Scott Allen Roofing for the donation of our metal roofing materials. We worked with Josh the Otter and the Joshua Collingsworth Memorial Foundation for our station and signage. Our sign were printed by Sign Express in Lecanto. Cayla’s Coats was formed in memory of Cayla Barnes who drowned at 19 months old. 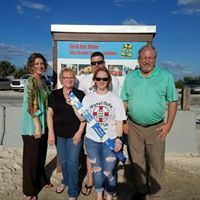 Cayla’s Coats was originally formed as a ministry in memory of Cayla Barnes through Gulf to Lake Baptist Church and provided warm coats to Citrus County elementary students. Over the past few years Cayla’s Coats as grown from distributing 400 coats the first year to a current total of over 4000 coats. In 2013 Cayla’s Coats came out from the umbrella of the church and formed their own 501-c3 not for profit.